I made this quilt last year for the Quilt Whisperers challenge which was initiated by Georgina Chapman and is based on this children's game. Several European groups took part in the challenge and all the quilts were shown at the 2014 Loch Lomond show in Scotland. The basic idea is that the first quilter in the group receives a photograph and has to make a quilt inspired by that picture. 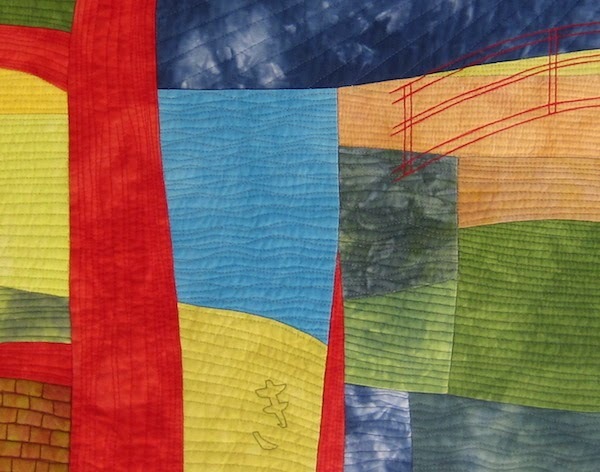 She then sends her quilt, without the photo, to the second quilter who makes a quilt inspired by the first one. When she's done, the second quilter sends her quilt to the next one, and so on, until the last quilter. Of course, each quilter only sees one quilt. She doesn't know what the others have done. The results are often very different and surprising. In Belgium, two groups of 10 quilters took part in the challenge. The quilts were shown at the National Show in Enghien 3 weeks ago. 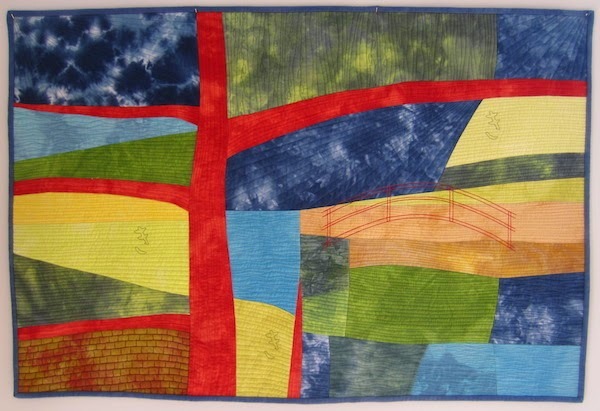 And here's the statement I wrote at the time I made the quilt: "I decided to keep the bridge and the tree, and to go for a colourful abstract landscape inspired by some of the quilts I made with the Twelve by Twelve international group. All my fabrics are home-dyed. I designed the tree and the bridge from pictures I took during my travels in Japan. While I was working on this quilt, sadly my mother passed away. The tree and the bridge then took an even stronger symbolic meaning for me, as the tree of life and a bridge of transition. The Japanese sign き, which reads as "ki", means tree and also spirit. " I'm so sorry to hear about your Mom passing away. It would be tough to lose a parent. I love the red color that you chose and then how you worked the background around the tree which is quite creative. I'm sure that it's even more special to you since you were working with fabric that you dyed yourself.